In a food processor, process the cilantro and onion. Add walnuts and jalapeno pepper. Add salt, pepper, and olive oil. Process until smooth. Two large round red tomatoes. Tops removed and cored. With a small spoon hollow out the tomato leaving 1/4 inch rim. 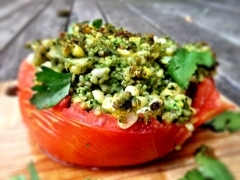 Mix quinoa with pesto mixture. Add corn salt and pepper. Mix well. Scoop mixture into each tomato. Bake in the oven for 15-20 minutes. MANY PEOPLE DON’T CARE FOR CILANTRO SO WHY NOT TRY IT WITH BASIL OR PARSLEY INSTEAD!